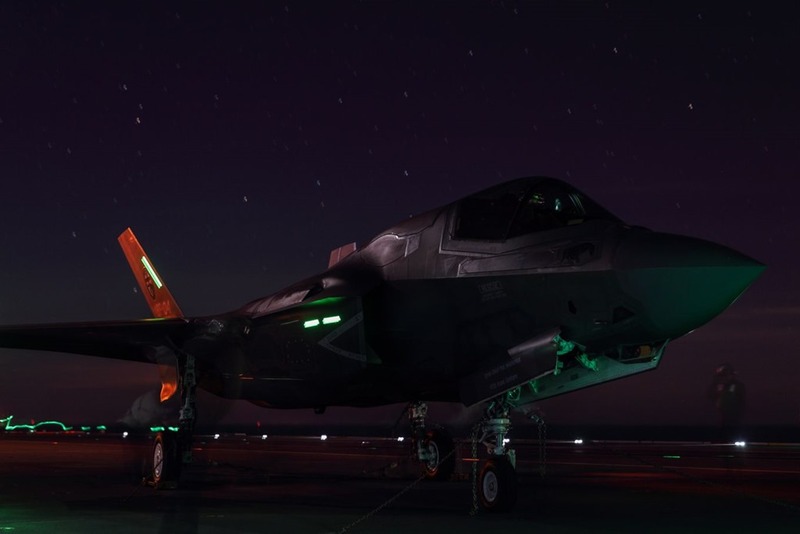 UK F-35 Lightning jets begin night flights on HMS Queen Elizabeth. 04 October 2018 - F-35 Lightning jets have conducted their first night flying trials off the United Kingdom’s largest warship, HMS Queen Elizabeth. The aircraft carrier, which first landed F-35 Lightning jets on board last week, is currently conducting flight testing off the east coast of the United States. Some trials were also carried out without night vision technology to ensure the jets’ capability in any eventuality. 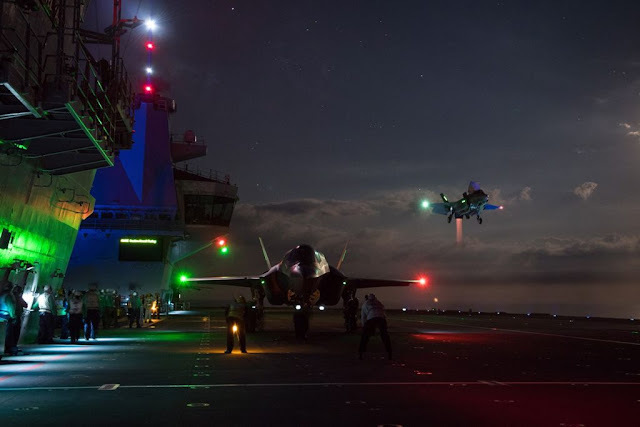 “The concept of night flying isn’t difficult for us - what we are looking at is what the new lights on board HMS Queen Elizabeth look like at night from the perspective of the F-35s. 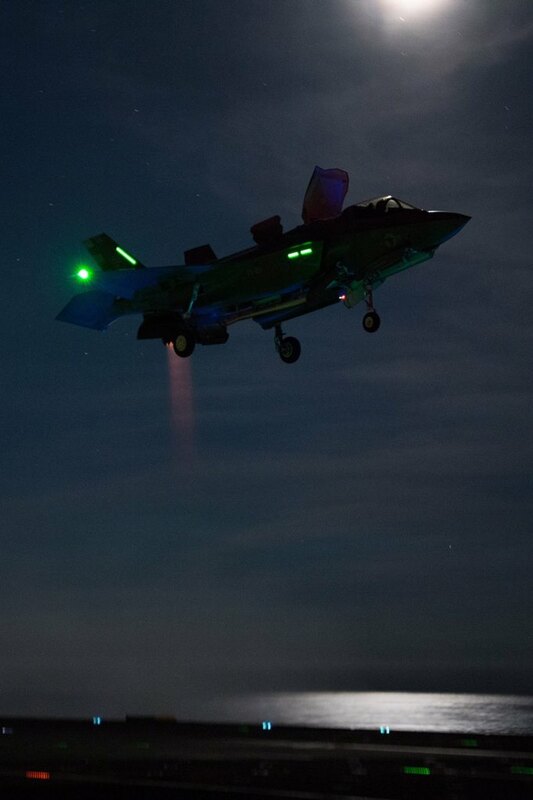 “We’ve already done that with the rotary wing aircraft earlier this year, but now it’s crucial that we understand how suitable they are for the F-35s to operate at night from the carrier. First indications are that they are in good order for both the aided and unaided perspectives”, Commander Air on HMS Queen Elizabeth, James Blackmore 'Wings' said. HMS Queen Elizabeth has been kitted out with specially-designed LED lighting on her flight deck to aid night time landings. Royal Navy Commander Nathan Gray and RAF Squadron Leader Andy Edgell were the first pilots to make history by landing their aircraft on the flight deck of the carrier on September 25th 2018 (Details here). HMS Queen Elizabeth left her home port of Portsmouth in August, crossing the Atlantic to conduct the flying trials, as well as training with the US Navy.